Hello everyone, welcome to Classic-Castle's first Job Mullers Contest, brought to you by Bluesecrets and Aliencat. 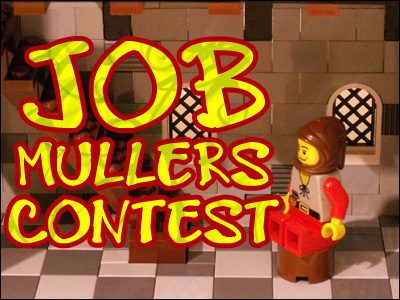 This contest is all about non-existent medieval jobs, who performed them, where and how. Click the thumbnail above to view the example workshop. You have to think up a profession that didn't exist in the middle ages, and show us how and where this job was done, in a MOC. Where is this job performed, consider things like a workshop, farm, mill or maybe something completely new. It can be a profession that exists nowadays but couldn't possibly be practiced in medieval times (think astronaut, electrician, jobs like that), or be a completely made-up one. The funnier the better. You can build a whole building or just a single room, just make whatever you think shows your chosen profession best. 1. You can enter your creation by posting in this thread. Be sure to tell us the name of the entry and add a link to the folder where the images are uploaded. Thumbnails are allowed but not mandatory. 2. The deadline for this contest is midnight GMT on the 22nd of February 2009. Creations posted after 23:59:59 GMT on the 22nd of February will not be accepted. 3. Your entry is limited to three photos, the maximum dimensions of these photos are 800x600 in any direction (bear in mind that you can post images no larger than 400x300 as previews in your post, according to the general Classic-Castle rules). 4. Your creation may be no larger than 32x32 studs (a stud overhang is allowed for minifigs and their accessories, and foliage). There is no height restriction. 5. Entries may not have been published online before the 2nd of February 2009. 6. You can give a short description in your entry post, or you can let the MOC and its title do the talking for you. 7. Custom parts are only allowed on minifigures, animals, or their accessories. 8. Ldrawn entries will not be accepted this time. 9. Once your entry is posted, you may not make any changes to it. Note that Classic-Castle.com can host no images for you, recommended services to host your photos are Brickshelf, Flickr and MOCpages. These are just examples, you are not limited to these. Make a folder or set just for your three contest photos. Folders or sets with more than three photos can unfortunately not be accepted. Your entry must follow Classic-Castle's Terms of Service. If you are in doubt if it is TOS appropriate, please PM an admin for clarification, before you post your entry here. The judges of the contest reserve the right to at any time remove entries they find unfit for the contest. The prizes are donated by Bluesecrets and myself. We will pay to ship these prizes to you. Last edited by Aliencat on Thu Feb 12, 2009 5:08 pm, edited 10 times in total. And good timing, I didn't have anything to build right now, i'm waiting for a bricklink order for a big castle. I hope i'll get a good idea. Great contest indeed, a nice variation. I'll try and get something entered. Nice contest! I will try to enter . This sounds like lots of fun! Is there a limit to how many entries? It sounds like one per person, but figured I would ask. Thanks! Nice Contest! Nice find of prizes Blue! shmails wrote: This sounds like lots of fun! Is there a limit to how many entries? It sounds like one per person, but figured I would ask. Thanks! You can enter as many entries as you like! Great news for me, my wife will be upset though! Thanks for the quick reply and the wonderful contest! Now this is an ...... interesting......... idea for a contest. I will try my very hardest to come up with something. Oooooo! Very nice! I like this idea! I shall begin work immediately! Thanks, Blue and AC! You two rock! Cool! Sounds like a ton of fun! Thanks for putting this on. Sounds great, and the prizes look great! By the way, I hope noone else was planning on doing Television Director.